-Replace their existing mail, collaboration, and messaging systems with a Google based software as a service solution. -Reduce costs by eliminating support overhead associated with the maintenance of in house solutions. -Access to the complete suite of Google Applications including advanced collaboration and video conferencing features. Power Over Ethernet, commonly referred to as POE, is a technology that provides power to devices attached to a data network. Defined by the 802.3af network standard, POE takes advantage of unused wire pairs in a network cable to transmit low voltage power. • Traditional phone systems can be replaced by IP without additional power connections. • Mobility – Phones can easily be moved wherever a network connection exists. • Safety – Provides lower voltage power than traditional 120-volt outlets. • Provides uninterrupted power to phones when combined with a UPS. • Phones can easily be remotely shut down by disabling power from the network switch. A handy feature when reboots are required to upload firmware changes. Additional applications for POE include security cameras, wireless access points and other network devices. To discover how a POE enabled network and phone system can benefit your business please drop us a note at sales@bitwaretech.com. 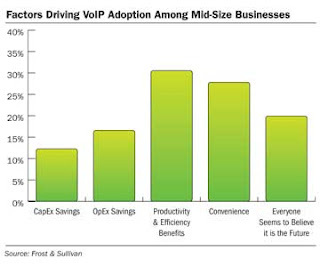 A recent study by IDC finds that cost savings will drive the transition to hosted VoIP and VoIP trunking over the next couple of years. "Essentially, the problem is that in many cases there is no current “problem” to fix. The “problem” essentially can be created, though. If a potential customer finds out that they are “overpaying” by quite some amount for their voice and broadband access services, that becomes a problem. " The article even mentions services provided by Junction Networks, a BitWare approved provider of VoIP trunking services for Asterisk. For those interested in the background, convergence is simply the transmission of voice and data across a single media. Traditionally, voice was transmitted across voice lines, or phone lines. This service is often referred to by telecommunications geeks as the Plain Old Telephone System or POTS. In the early 90's phone companies began offering a new type of network service know as the Integrated Services Digital Network or ISDN. ISDN came in two flavors, 128kb BRI and 1.5mb PRI. The great thing about ISDN was that it was the first technology to use channels for both voice and data. In modern terms convergence is the transmission of voice, data, video, and anything else you can imagine across a data network -- either the Internet or a private network. Some great examples of convergence are the cable company providing broadband Internet, television, and phone service over cable; AT&T U-verse that sends television, phone, and Internet over DSL; and hosted voice services such as Vonage. So, all this convergence stuff is really great, but how does that save a business money? There are several methods available to achieve cost savings from converged technologies. In fact, for a new phone system there really is no other way to go from an ROI and feature benefit's perspective. For existing phone systems it really depends on the situation. However, generally speaking converged networks are less expensive to maintain, do not require multiple networks within a single building (i.e. a telephone network and separate data network), and offer features such a using the Internet to interconnect multiple phone systems, thereby bypassing the phone company (free phone calls between sites, woo hoo!). Do you even like your current phone company? Other advantages, such as least cost routing can also be leveraged. Having an IP capable phone system that can select traditional circuits for free local calls or cheaper IP trunks for international calling adds up to big bucks when the phone bills arrive. Using the provider that gives the best rate for a given calling scenario puts the power back into the customer's hands to negotiate a route that is most cost effective while putting pressure back on the phone companies to offer competitive rates. If your business is intersted in a free phone bill analysis to determin if it is currently paying too much for voice services we would love to hear from you. Just drop us a note at sales@bitwaretech.com and someone will contact you shortly. We are excited to announce the addition of directory management to the BitWare Unified Communications server through version 1.1 of our device management feature. We pride ourselves in our ability to deliver Asterisk solutions to our customers with features that set us apart from our competition. Our device management feature, that configures and manages Polycom phones within the FreePBX extension module, is one of the value added features incorporated into our systems. • Creates phone configurations in one easy step. • Manages changes to existing configurations. • Ensures that phones are configured consistently with a standard set of options. • Saves configurations in the tftpboot server directory where they are uploaded by phones. • Creates a central repository for phone configurations. Now in addition to managing phone registrations, our updated device management module also creates directory files. By default device management will create a new directory file for all of the devices registered to the system whenever a new phone is configured. By also checking the Generate Directory checkbox, device management will create a special directory file for that phone allowing accesses to the presence of other phones registered with the phone system through the Busy Lamp Field [BLF] feature available on many popular IP phones. Device presence is a great feature for receptionists or other users who need to see the status of other phones in the office. This feature is even more exciting combined with the Polycom sidecar expansion module for the Soundpoint IP 601 and 650 phones. The sidecars, combined with presence, turn the phone into a full-featured attendant console capable of displaying the status of 46 or more extensions. For more information about device management and the many other features of UCS please visit our products page at www.bitwaretech.com/products. Please note this feature is currently available for Polycom phones. While we do not currently support other brands , the code is flexible enough to support other device brands upon request. If you are interested in incorporating device management into your Asterisk/FreePBX installation, or if you would like more information about our phone system please e-mail us at sales@bitwaretech.com. Of course for all of our existing customers under our support this is a free update. Digium, corporate sponsor of the Asterisk open source telephony project, reports a record rise in Asterisk downloads. For 2008 over 1.5 million copies of Asterisk were downloaded marking a 50% increase in Asterisk distribution. According to Digium the increase stems from businesses searching for cost efective technologies in a dificult economy. For businesses who have already discovered the wonderful features and cost savings associated with an Asterisk based phone system this should come as no surprise. Those who have not may be interested to learn that Asterisk is a full featured business phone system capable of Voice over IP as well as traditional voice services. Welcome to the BitWare Technologies LLC Voice Over IP and Technology blog. BitWare, a Michigan based technology solution company, provides services to small businesses and specializes in phone systems based on the Asterisk open source phone system, data networking and Voice over IP. Founded in 2005 by telecommunications and data network veterans, we are now in our fourth year of service. If you are interested in a voice solution please take a moment to view our product line at www.bitwaretech.com.